The cause of death, prosecutors say, was a "lethal combination of drugs" ingested through Jones' breast milk. A preliminary hearing for Jones has been scheduled for July 23, say court records. It was 3 a.m. and Samantha Whitney Jones' 11-week-old son was crying.So, Jones did what many mothers would do: She sat down and tried to breastfeed him.About five hours later, her baby would be dead. 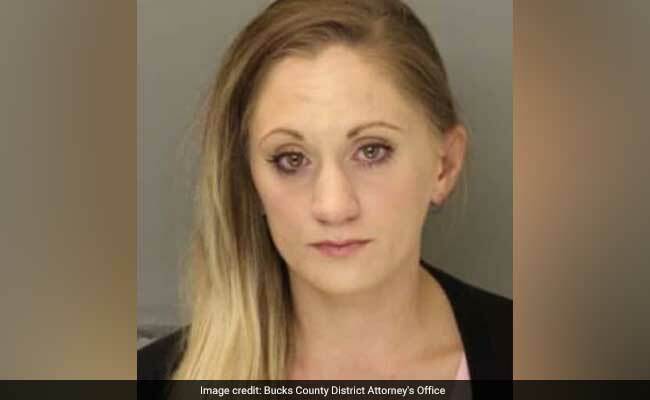 On Friday, the 30-year-old Pennsylvania mother was charged with criminal homicide for the April 2 death of her infant son, identified in documents as R.J. An autopsy revealed that the baby's blood contained methadone, amphetamine and methamphetamine, according to a probable cause affidavit. As the investigation is still ongoing, it is possible Jones could face charges that carry a mandatory life sentence, Deputy District Attorney Kristin McElroy said in a statement from the Bucks County District Attorney's Office. Jones' bail was set at $3 million cash, the statement said. Louis Busico, the lawyer representing Jones, could not be reached for comment. In the early morning hours of April 2, Jones told police she was "too tired" to go downstairs and make a bottle of formula for R.J., according to the affidavit. Instead, she opted to breastfeed, but said she "dozed on and off" and wasn't sure if he actually drank any milk. At around 6 a.m., Jones' husband found the pair. Jones was asleep and R.J. was crying, the affidavit said. The baby was lying in his bassinet, pale and not breathing with "bloody mucous coming out of his nose," according to the affidavit. Jones immediately shouted for her mother, Cheryl Jones, who also lived in the house, and called 911. Cheryl began CPR and police arrived minutes later to find R.J. in cardiac arrest, authorities said. He was rushed to Doylestown Hospital, just over six miles away, but it was too late. At around 8:30 a.m., R.J. was pronounced dead in the hospital's emergency room. Jones told police that she primarily breastfed her baby, but switched to formula a few days before his death because she was worried R.J. "wasn't getting enough milk from breastfeeding and therefore was not sleeping," the affidavit said. Authorities analyzed the contents of the baby formula and the bottle used to feed R.J. the morning he died, and neither tested positive for "illicit drugs," according to the affidavit. At the time of R.J.'s death, Jones said she was taking methadone, which she had been prescribed as part of treatment for a painkiller addiction. Jones had also taken the drug while she was pregnant with R.J., investigators said. According to a 2008 article published in Canadian Family Physician, a peer-reviewed journal, women using methadone as part of medical treatment should not be discouraged from breastfeeding. "The benefits of breastfeeding largely outweigh any theoretical minimal risks," the article states. However, stimulant drugs such as amphetamine or methamphetamine are thought to "concentrate in breast milk and may cause irritability and disturbed sleep in babies," according to the Mater Mothers' Hospital in Australia. The hospital advises women not to breastfeed for 24 to 48 hours after using those types of drugs and emphasized the importance of pumping and dumping tainted breast milk. In 2002, California mother Amy Prien was charged with second-degree murder after the coroner's office confirmed that her 3-month-old son overdosed on methamphetamine, which entered his system through breast milk. She pleaded guilty to involuntary manslaughter in 2006. In 2012, another California mother was sentenced to six years in prison after her 6-week-old baby died after ingesting breast milk that also contained methamphetamine. In 2014, Stephanie Greene was given a 20-year prison sentence in South Carolina for the death of her 46-day-old baby, who died in November 2010 of respiratory failure. Tests revealed that the baby's blood contained toxic levels of morphine and clonazepam, ABC News reported. In court Friday, Busico, Jones' lawyer, said she had "suffered the biggest loss any human being can suffer," the Intelligencer reported. He called the baby's death "a horrible accident of unfathomable proportions," but said it was not a homicide. A preliminary hearing for Jones has been scheduled for July 23, according to court records.